Egypt’s military deposed the country’s first democratically elected president Wednesday night, installing the head of the country’s highest court as an interim leader, the country’s top general announced. Gen. Abdul Fattah Al-Sisi said the military was fulfilling its “historic responsibility” to protect the country by ousting Mohamed Morsy, the Western-educated Islamist leader elected a year ago. Morsy failed to meet demands to share power with opponents who thronged the streets of Cairo, and those crowds erupted as the announcement was made. “One of the mistakes I cannot accept — as the president of all Egyptians — is to side with one party over another, or to present the scene from one side only. To be fair, we need to listen to the voice of people in all squares,” the statement read. 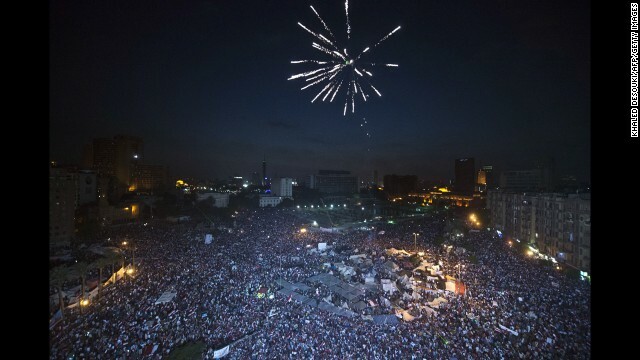 But as night fell Wednesday, troops surrounded a pro-Morsy demonstration at a Cairo mosque and took control of a key bridge across the Nile River. 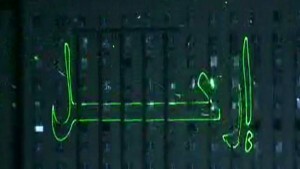 Gehad El-Haddad, a spokesman for the Muslim Brotherhood, reported via Twitter that tanks were on the streets. Morsy was said to be working from a complex belonging to the country’s Republican Guard, across the street from the presidential palace, according to Egyptian state media. Reuters reported that troops were setting up barricades around that facility. In Washington, State Department spokeswoman Jen Psaki said the U.S. government — Egypt’s leading ally — could not confirm reports of a coup. Psaki said the United States is not taking sides and urged all parties to come to a peaceful resolution to the “tense and fast-moving” situation. An aide, Essam El Haddad, said in a Facebook posting that a coup was under way and warned that the generals risked bloodshed by moving against Morsy. “In a democracy, there are simple consequences for the situation we see in Egypt: The president loses the next election or his party gets penalized in the upcoming parliamentary elections. Anything else is mob rule,” he added. 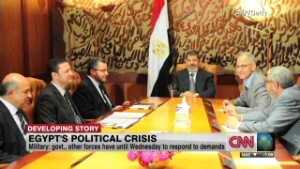 “The people have decided that Mr. Morsy was no longer the legitimate leader of Egypt,” he told CNN. On Tuesday night, Morsy had vowed that he would not comply with the military’s 48-hour ultimatum and demanded that the armed forces stand down. “If the price of upholding this legitimacy is my own blood, I am, therefore, ready to sacrifice my blood for this country and its stability,” he said. “He was trying to give the impression ‘We are there in numbers, and we are going to retaliate, we are not going to allow this to happen.’ However, with almost 24 hours since his message, it’s clear his supporters will not dare challenge the crowds on the street,” Kassem said. Reuters and several other news organizations reported that Egyptian troops had “secured the central Cairo studios of state television” as the deadline approached and that staff not working on live shows had departed. CNN has not confirmed the reports; state television denied in an on-air banner that there was any additional military presence at its studios. Massive demonstrations for and against the former Muslim Brotherhood leader who was elected to office a year ago have been largely peaceful. But 23 people died, health officials said, and hundreds more were injured in clashes overnight at Cairo University, the state-funded Al-Ahram news agency reported. Protest leaders have called for nonviolence. Egypt’s military met Wednesday with religious, national, political and youth leaders to address the crisis, Egyptian military spokesman Ahmed Ali said through his Facebook page. 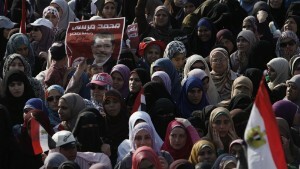 Hours earlier, an opposition spokesman accused the United States of propping up Morsy out of concern for neighboring Israel. “The hour of victory is coming,” said Mahmoud Badr of the Tamarod opposition group. He predicted that the “illegitimate president” would be gone by the end of the day. 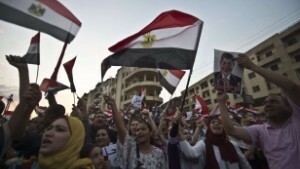 “Not America, not Morsy, not anyone can impose their will on the Egyptian people,” Badr said. 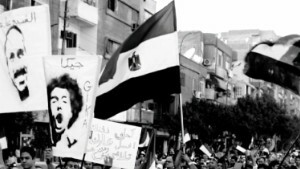 With the ultimatum, the armed forces appeared to have thrown their weight behind those opposed to Morsy’s Islamic government. Early Wednesday, soldiers and police set up a perimeter around the opposition’s central meeting point, Cairo’s Tahrir Square, “to secure it from any possible attack,” the state-run EgyNews agency reported. It was the police who, on the same spot in 2011, killed hundreds when they fired upon democratic, moderate and Islamic demonstrators seeking to overthrow Hosni Mubarak, the country’s longtime autocratic leader and U.S. ally. Mubarak had repressed the Muslim Brotherhood, an Islamic political movement that emerged as the nation’s most powerful political force once Mubarak was ousted. 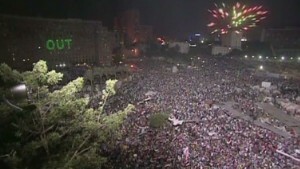 At a pro-democracy protest in Cairo, demonstrators expressed anger and fear over what the coming hours could bring. The Muslim Brotherhood spokesman, Gehad El-Haddad, told CNN that tanks and armored vehicles — accompanied by thugs carrying knives, pistols and ammunition — had been moved to the northern and southern entrances of the square in an apparent attempt to drive them out. 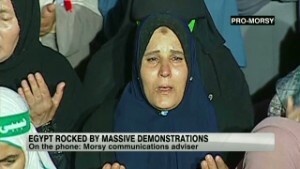 The military fired warning shots into the air, and shot one Muslim Brotherhood member in the leg, El-Haddad said, but the remaining protesters were standing in defiance in front of the tanks. Some of the protesters oppose Morsy but also oppose pushing from power a democratically elected leader, he said. “Under no circumstances will we ever accept a military-backed coup,” he said. But many of the democratic reformers and moderates who accused Morsy’s government of moving in an authoritarian direction now support former Mubarak allies and others fed up with the nation’s direction in calling for the restoration of order through the military. They have been pushing to oust Morsy and his Muslim conservative government, whose leaders were drawn primarily from the ranks of the Muslim Brotherhood. They say they have collected more than 20 million signatures on a petition to remove him — millions more than the number who voted Morsy into the presidency. 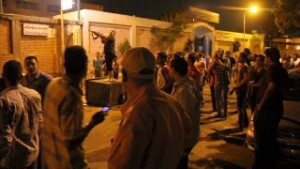 In recent days, anti-Morsy demonstrators have ransacked Muslim Brotherhood offices all over the country. Military leaders have told Arab media that they were planning to suspend the constitution, dissolve the parliament and sideline Morsy. In his place, they would install a mainly civilian interim council until a new constitution can be drafted and a new president elected.